One of the great services that we offer in our St. Petersburg pet resort is grooming. This can be a wonderfully pampering experience for your pet! We use natural shampoos that nourish their coats and skin, leaving them feeling and looking their best. We even provide indulgent extras like a creme rinse conditioner and cucumber facial scrub. Coming to our grooming facility is a lot like going to the spa for humans, and you know how great those pampering days can make you feel. But grooming isn't just about making your dog look and feel good, it's actually something that's very important to their health. If it's been a while since you've taken your pet in for a grooming session with the team at our pet resort, you should know about all of the health benefits they could be missing out on. Brushing spreads the skin's natural oils through the hair. If your pet's coat is lacking luster, it could be because they need to be brushed more often. Your pet's skin secretes oil, just like yours does. When their fur is brushed, those oils are spread through the coat and work to condition the fur. This can lead to a softer, shinier coat that's less prone to dryness. That dryness can quickly lead to itchy skin, redness, and more shedding. A well-conditioned coat will shed less, too, which is good news for your furniture. It can help your pet become more social. Grooming teaches your pet that being touched by humans is a nice thing. They associate touch with strangers as a positive thing, which makes them more social outside of the grooming room as well. A well-socialize dog is one that's easy to take with you everywhere and is happy to meet new people, new animals, and have new experiences. A poorly socialized pet can be shy, and even worse could be at risk of snapping at strangers or even biting them. 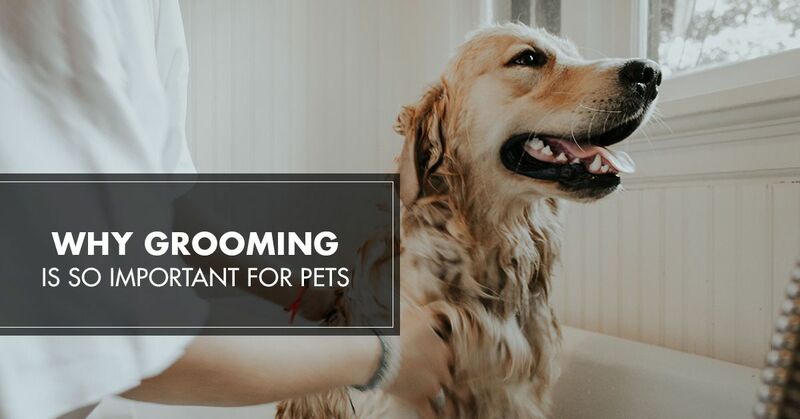 The process of grooming also gets your pet used to being examined at their veterinarian appointment, which can make those visits a lot less stressful. Grooming is an important part of socialization and should start with your pet early on. Dental problems are a huge health risk for pets. Grooming is a good chance to check out your pet's teeth. While most grooming won't involve a full cleaning of your pet's teeth (this is done by a veterinary professional, usually under sedation), it is a chance for the groomer to take a look at the teeth. Regular examinations of the teeth can help you determine if there is a potential problem with the teeth, such as plaque buildup or teeth that will need to be pulled. Issues with teeth can lead to much more serious concerns with your pet, so it's important to check them regularly. Long nails & matted fur can become painful. Animals who aren't groomed regularly can actually be in pain. That's because neglected fur can end up matting up, causing it to pull at the pet's skin and become very painful. Nails that aren't regularly trimmed can grow into the bed of the paws, cutting your pet and making it difficult for them to walk. Some pets, such as cats, are able to primarily take care of their fur themselves (although many of them love to be brushed!) and active animals may wear down their nails without additional trimming. However, if you see these areas becoming an issue, you need to increase the frequency of their grooming schedule. Certain health concerns can be caught and treated sooner. One of the biggest health benefits of grooming for your pet is the fact that they'll be closely examined by a groomer. An experienced groomer, especially one who is familiar with your pet, will be able to carefully examine your pet during the grooming process for any signs of issues. This could include lumps or bumps under the skin, dry patches, issues with their eyes or eyes, or even if your pet seems to be suddenly sensitive in certain areas of the body. Finding these issues early may make more easily treatable by your vet. Want Your Pet to Experience All of These Benefits and More? Royal Pets can help you ensure that your pet experienced all of these benefits and many more. We go above and beyond the normal level of pet grooming and provide your pets with a head-to-tail experience that they'll love. We do everything possible to ensure your pet is safe, healthy, and happy during their time with us, and you'll notice the difference when you come to pick them up. They'll be excited to show off their new style! Ask about our grooming packages that can provide your pet with the pampering they really deserve. Great as gifts for the pet owners in your life, too! Our packages can be tailored to the needs of the pet. Don't forget to check out our other services, too, including our pet resort and veterinary center. Combine your pet's time in our resort with a pampering trip to our grooming salon or double up with your next veterainary appointment and ensure your pet has all of the care they need. Is It Time to Make a Grooming Appointment for Your Pet? We have appointments available! Get in touch with our pet resort in St. Petersburg to make a grooming appointment for your pet. We have a variety of appointment times available so you can choose one that works with your busy schedule. Simply drop your pet off with our experienced team and we'll take care of everything, providing the grooming services that your pet needs in order to look and feel their very best. Have questions about our grooming services or need to make an appointment? Simply give us a call or contact us through our website today.